Back again for my July battle of the beauty subs. Summary: I was really excited to receive Stila’s Liquid matte and theBalm bronzer from Birchbox, however I have been really bummed with all the sunscreen and Supergoop products lately. Now Ipsy really outdid themselves this month! The bag itself was super cute and I loved every single item in it. 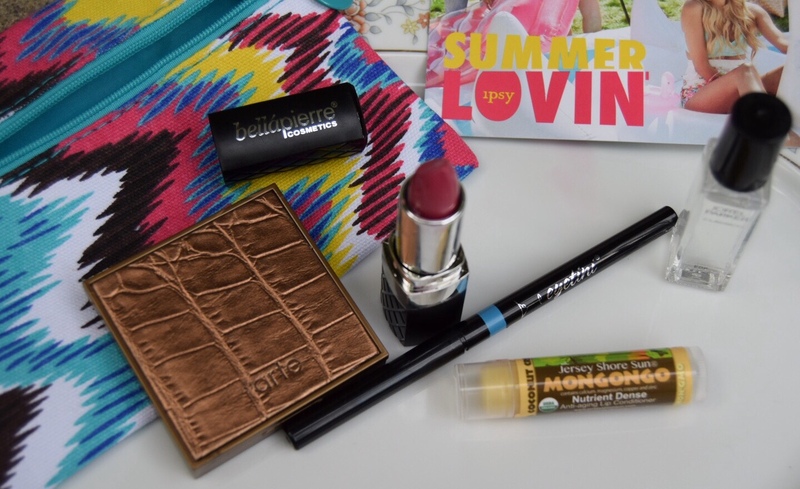 I actually can’t live without the Jersey Shore lip conditioner and I’m not typically a bronzy girl but the Tarte bronzer was toned down to the perfect shade for me. Ipsy has it hands down for July! Side Note: I just saw the Birchbox sample reveal for August and I can say, without a doubt, that it will be tough for Ipsy to compete with that!